Resilience involves the modification of a person’s response to a potentially risky situation. People who are resilient are able to maintain high self-esteem and self-efficacy in spite of the challenges they face. By fostering resilience, people are building psychological defenses against stress. The more resources and defenses available during a time of struggle, the better able to cope and bounce back from adverse circumstances people will be. A person’s ability to regain a sense of normalcy or define a new normalcy after adverse circumstances will be partially based on the resources available to him/her. Resilience building can begin at any time. Following is information regarding applicable ways to implement resilience practices, as well as situations that could inhibit resilience, situations that enhance resilience, and people who help facilitate the growth of resilience. 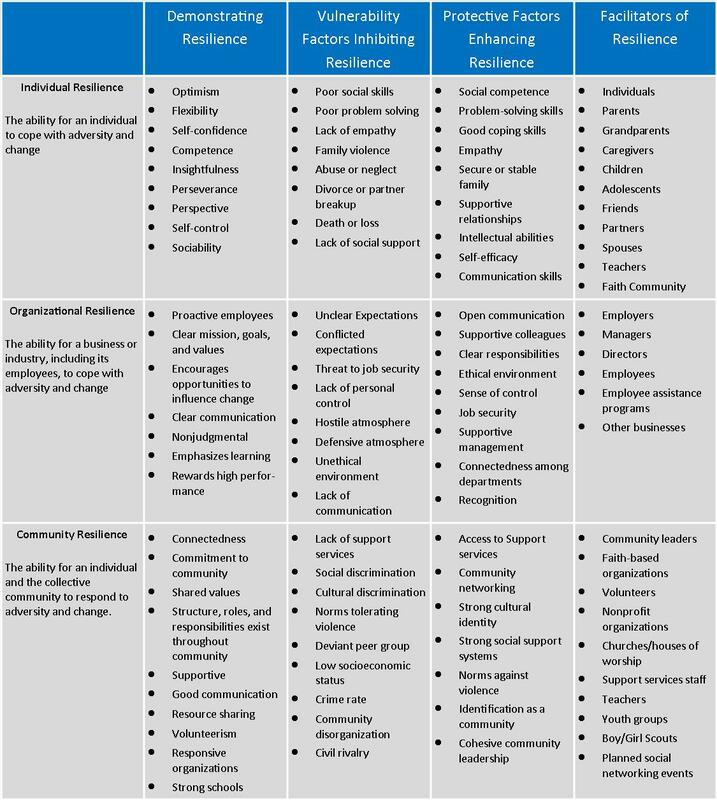 How is Community Resilience Fostered? Kelly, S. (2007). Personal and community resilience: Building it and sustaining it. Retrieved March 23, 2009, from the University of California Los Angeles Bureau for Behavioral Health and Health Facilities at http://www.wvdhhr.org/healthprep/common/resiliency.ppt#256.